A standard barbecue sauce base gets a heavy dose of mustard to create a flavor that's incredibly robust and complex, taking things a step further than your average mustard-based sauce. 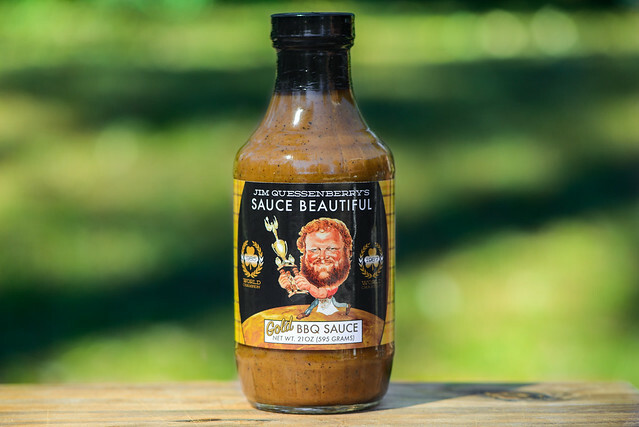 Jim Quessenberry—a two time Irish Cup International Barbecue Contest champion and pitmaster of the Arkansas-based Trav'ler competition team—gets the name and face recognition on this brand, but it's his two sons, Michael and Lee Quessenberry, who are the ones currently carrying on their father's traditions. They're doing this primarily through the production and marketing of Jim's sauces and rubs, keeping those winning recipes alive and kicking. The started out with the original recipe, dubbed Sauce Beautiful, and then branched out to create a line-up that also includes a hot version, white sauce, and now a mustard-based sauce as well. The aroma of this sauce can best be described as a tangy honey mustard. First and foremost is a pungent mustard component whose sharpness is cut by a lesser amount of sugar, which has a hint of molasses to it. The mustard tang is ramped up, however, by a boost of vinegar. Along with these primary characteristics, there are more subdued notes of tomato and a mild peppery heat that adds to the nose tingle that was already started by overall tartness. This sauce has a yellow-brown mustard hue and a glossy sheen. It's semi-transparent, making it easy to see a plethora of spices that are mostly small black and white specs. Its consistancy is medium-thin with a slight texture, and the sauce falls first in a large drip first, followed by a quick and steady pour. The sauce then slows to quick drips, and then a few slow ones, before stopping and leaving a medium coating of sauce left clinging to the silverware. 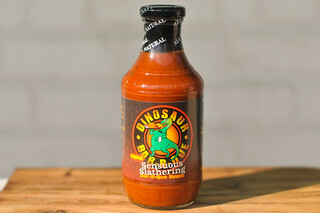 The first taste of this sauce is almost all sweetness, but very quickly a strong, pungent mustard bite brings some balance to the sugars. Next, that prominent vinegar from the aroma starts to work its way in, but at the same time there's a complex background building that's a mixture of tomato, Worcestershire, and a bit of onion powder flavor. As the sauce settles longer on the tongue, the mustard and vinegar become more dominant, making the sauce turn more tart and pungent right before a wave of black pepper heat comes in. This creates an aftertaste that has multiple layers of heat with just a little bit of lingering sweetness. 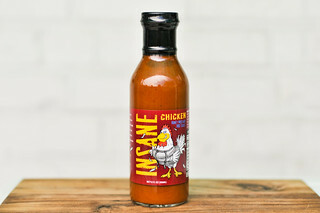 This sauce coated the chicken in a medium, even layer that baked down well over indirect heat. When moved directly over the coals, there was some light caramelization along with a little burn off. The mustard flavor became more prominent after being cooked, giving the leg a very pungent flavor that was kept in check a bit by a heightened sweetness. The tang and peppery heat also persisted, but all the components felt a bit off balance compared to how they were working together out of the jar. 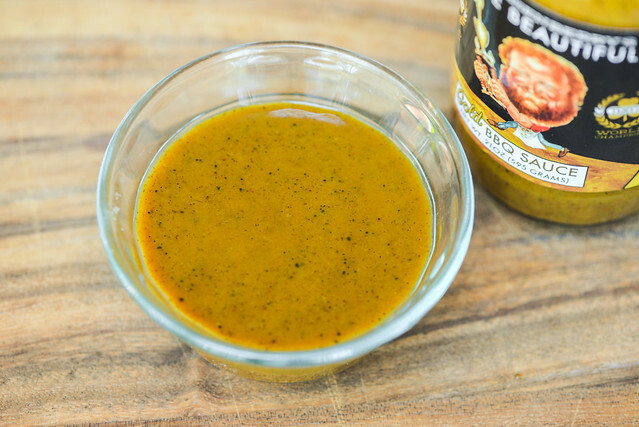 It's hard for a mustard sauce not to be a barbecue challenge—you take what's usually equated as being a sweet and/or spicy medium and add in a component that's so strong and pungent on its own, it's hard for it to not to become overpowering. 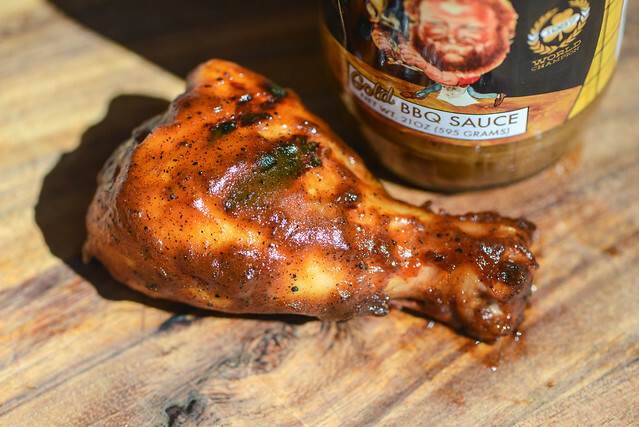 This Gold BBQ Sauce takes an interesting approach though by using was tastes like a standard tomato barbecue sauce base and adding in mustard, giving the sauce more complexity than your standard mustard-based variety. I think out of the jar this worked really well, with a complex and sharp flavor that had just the right amount of sweetness and heat to make it pleasing to eat spoonful after spoonful. Things didn't taste as harmonious after being cooked though, and while the sauce retained all its great traits from its raw state, something just tasted a bit off. That's not an uncommon finding with mustard sauces though, which, in my experience, usually fare better off the grill, and that's the ideal way to enjoy this sauce, in my opinion. 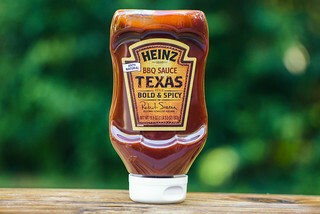 With its standard barbecue sauce foundation, this sauce is well suited for things like a final slather on smoked ribs, a dip for brisket or steak, a brushing for grilled pork chops, and a lot of other hearty meats that can balance well with a strong mustard flavor.